Canadian Vending & Office Coffee Service Magazine - September 2001, Page 6. Welcome to Stella Yoon's world. As CEO of cStar Technologies Inc., a small Toronto-based, high-tech company with a big vision, Yoon is tapping into a market that is bigger than the Internet; and a market that needs a low-cost, effective way to manage its remote assets and operations. She calls it "Wave III" of the Internet revolution and her company is leading the way. Using a unique technology her team developed and patented, cStar is connecting non-IT devices, which are not primarily designed for remote data communication, to an IT world, through wireless WAN, LAN, or power lines, eliminating the need to install cables or phone lines. And cStar is starting with vending machines. "Now the vending market is opening. It has been waiting a long time for an affordable, extremely fast, secure, two-way data exchange," explained Yoon. "We can offer remote data communication at a very low cost and that is due to the scalability of our products." And that is the cornerstone of Yoon's philosophy - to make sure technology is affordable and accessible to everyone. "Monitoring systems have been around for ten years but it was too early," she added. "Technology was not robust and the price was humongous so it didn't make financial sense then." But that has changed with the introduction of cStar's SkyGate® and DirectGate®, a wireless telemetry system bundled with software. Take an ordinary snack or beverage machine. Sit a small antenna on top of the machine and have it transmit data, through wireless LAN, WAN or power lines, to a console sitting in a company's main office. The information gathered will help that company increase its sales and decrease its costs by effectively monitoring each machine. The system checks on the amount of product available in each slot, the amount of money in the cash box, the temperature inside the machine and alerts the operator of any repair problems or vandalism. "How many times have vending professionals stopped at a location only to find they didn't have to go there that day? They are completely in the dark," explained Yoon. "Now they can know in an instant what they need for each machine and can plan ahead." The biggest challenge for the vending industry, according to Yoon, is finding cost-effective ways of stocking and servicing machines in the field. cStar's technology can network all the vending machines in a building or complex to one wireless device, via low-cost PLC (Power Line Carrier) or a wireless LAN device, which sends data from all the machines, to handheld devices, laptops, desktops and servers using a variety of protocols and connection methods. But cStar's technology is not only for large vending operations. The company has solutions for smaller operators at affordable prices. cStar is opening the market with Computer Associates (CA, www.ca.com), a leader in eBusiness management solutions to offer monitoring services through CA's Optimal Vending Solution (OVS) powered by Unicenter. For more information on cStar's monitoring solutions call Thomas Flynn at 416-739-8484, ext. 216 or e-mail tomflynn@cstartech.com or info@cstartech.com. 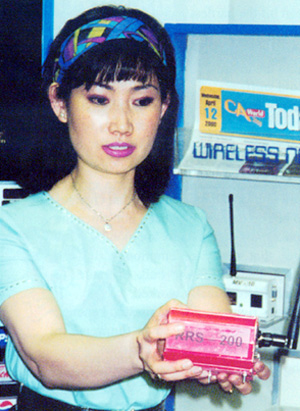 Stella Yoon, CEO of Toronto-based cStar Technologies Inc., with her patented telemetry devices that offers small and large operators wireless monitoring and affordable prices. 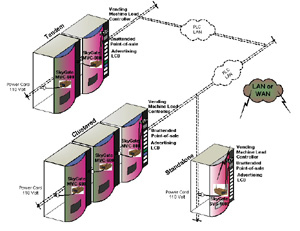 Shown here are vending machines with cStar's MVC-600 & MVC-800 Power Line Carrier series (PLC) nodes, tandem connected, point-to-point and cluster connected point-to-multipoint configurations, between vending machine lead controller boards. The nodes send and receive data along building, electrical wiring, enabling two machines in tandem, or more, to operate as one.